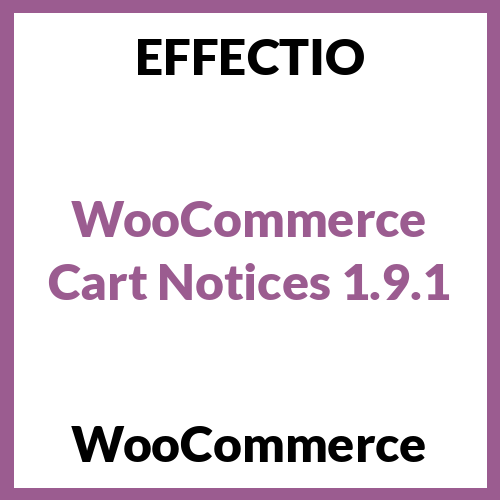 Add dynamic notices above the cart and checkout to help increase your sales! Woocommerce Cart Notices allows you to display dynamic, actionable messages to your customers as they check out. You can easily and effectively increase sales and customer satisfaction by displaying dynamic messages to your customers as they check out. Easily create as many notices as you’d like based on a particular product or product category in the cart, or using other criteria. Leverage proven tactics to increase conversions so that you earn more from customers you already have, and let them know of sales and promotions to improve the shopping experience. Add messages anywhere on your site shortcodes are allowed (for example, display promotion notices at the top of a shop or category page). Display dynamic notices with the use of message variables (for example, you can set a minimum amount for free shipping, and the message dynamically displays the difference the customer needs to add to their total to qualify). Useful for encouraging additional purchases to qualify for free shipping or to receive a free gift. Set any minimum amount you want, and find a way to encourage customers to hit it! Great for encouraging customers to checkout within the next X minutes to have their order ship today or purchase before a sale expires. Setting deadlines creates a sense of urgency that will help you close sales. Display a notice based on the site the customer came from to personalize the shopping experience. Display a notice based on the products in the cart. Cross-sell your related products and appear helpful to customers at the same time. Display a notice based on the product categories contained in the cart. Recommend similar items to improve the shopping experience. Recommended! Displays custom messages to your customers on the cart and checkout pages. Useful plugin for encouraging additional purchases to qualify for free shipping or to receive a free gift.